Chaga has a black outer layer that almost looks like it has been burned. It's found on birch trees, yellow and white birch, and mostly in the northern heifers. It is very popular in Russia and starting to become popular in Canada for its numerous health benefits. Once taken from the tree you will notice its underside is a yellow colour that looks almost spongy. 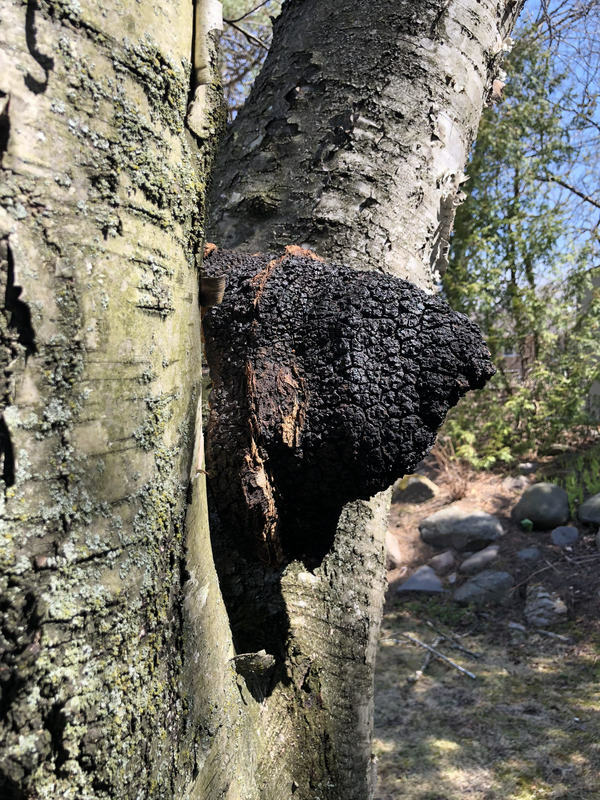 Chaga is a valuable resource and has yet to reproduce on a large scale, so when you are harvesting chaga make sure you are doing so in a mildly and suitable manner. Chaga is best harvested when the sap isn't running in the birch trees. This is going to be late fall, early spring and throughout the winter months. This is because when the sap is running it is going to full up the chaga with mostly water and get rid of most of its nutritional benefits. Be sure to only harvest chaga from living birch trees! 10-20% on the tree. This way it will regrow and will be able to be re-harvested in the future. This is very important because of its rarity and inability to be commercially grown.